A Loss Function describes the losses a system suffers from different values of some adjustable parameter. A commonily used example is the optimum adjustment of the temperature in a workshop to produce the greatest output. Everyone working in the room has their own loss function – a parabola. Taken as a whole, the loss function for everyone in the room will also be a parabola. Any departure from the optimum temperature will cause a loss. This can be applied to the continuous improvement of processes through the reduction of variation about a target, or Nominal Value. Born in 1924, Genichi Taguchi helped to revolutionise manufacturing processes in post-war Japan. His ideas have been subsequently adopted by successful manufacturers around the world and form part of performance improvement methods such as Lean and Six Sigma. One of his contributions was the application of the Loss Function to Quality Management. Taguchi challenged the idea of working to ‘standards’ or within set tolerences. Instead, he argued that improved quality and lower cost could be achieved by setting a Nominal Value and then working to reduce the degree of variation that occurred about this point. 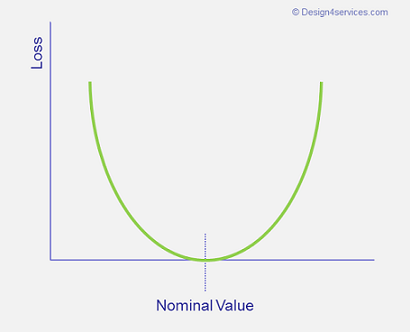 The further a product or service is from the Nominal Value, the greater the economic loss to the organisation or system. Setting this in the context of a business organisation, to be successful it is essential to understand and respond to what matters to the customer – their Nominal Value. If they experience good service, the organisation is likely to be delivering that service in the most economic way. If they do not, the organisation is likely to consume more resources in providing or rectifying the service, or risk losing the customer altogether.